Written by Felicia Roach. Media by Courtney Murphy. Whether you’re a pop music guru, or someone who notices the lives of celebrities, you know exactly who Justin Bieber is. The Biebs has been caught up in quite a few relatively reckless and offensive activities over the past couple of years, while also producing albums that contain some of the catchiest chart-toppers. Since you’ve made it this far into the article, keep reading for a recap into the great (and not-so-great) moments of Bieber’s career as a superstar. In 2008, Scooter Braun, a marketing producer for So So Def Records, accidentally clicked on one of Bieber’s videos on Youtube while searching for some fresh talent. He was extremely impressed with what the boy had to offer. Within months, Bieber packed his bags and moved from his home in Ontario, Canada, to record demos in Georgia. While there, Bieber performed for Usher and signed a record deal with Raymond Braun Media Group. After his hit “One Time” went certified platinum in Canada, Bieber released his first album, entitled “My World” in November of 2009. This album included hit songs like “One Less Lonely Girl.” Less than a year later, Bieber released his second album, “My World 2.0.” On this album, he reached the Billboard Top 10 with his infamous song “Baby.” In just a few months, the video for “Baby” surpassed Lady Gaga’s “Bad Romance” as the most viewed, but also soared as the most disliked video on Youtube. On a more personal note, in December of 2010 Bieber was reported to be in a relationship with former Disney star, Selena Gomez. His fan base, known as the “Beliebers” weren’t thrilled with the news of Bieber’s new relationship. But they never stopped supporting him, especially considering he won four AMA’s in 2010. In 2011, Bieber starred in a concert documentary, “Never Say Never.” This film featured every fangirl’s dream: clips of concerts, backstage access, and behind the scenes footage of their favorite celebrity! It must have been a popular thing to do at the time, considering the Jonas Brothers and Miley Cyrus/Hannah Montana also created concert documentaries in previous years. Although the movie was the source of many jokes, it did earn more than $73 million at the box office. 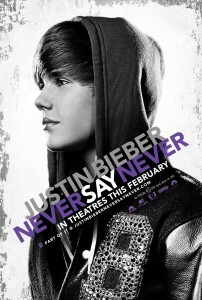 The Beliebers hit the theaters in scores! He was also criticized for making the comment that Anne Frank “would have been a Belieber” after visiting her home in Amsterdam in April of 2015. The scrutiny continued when he was caught on film urinating in a janitor’s closet while yelling profanities about a former U.S. president. One of the most famous cases of his inappropriate antics was his arrest for suspicion of drag racing and driving under the influence. The breathalyzer doesn’t lie–Bieber was taken into custody, and stayed until he posted bail (It must have been too late to say sorry). 2015 was definitely the year for Justin Bieber to make his comeback. He modeled for a Calvin Klein ad, which gained a lot of attention. Shortly after that, he collaborated with Diplo and Skrillex and released “Where Are Ü Now,” a Top 10 hit of the summer. Then, in October of last year, he released his first number one single, “What Do You Mean?” He released his most current album, “Purpose,” in November of 2015. If you haven’t heard it yet, check it out! Justin Bieber is truly an interesting character in pop culture, but he definitely has talent. Whether that talent is for creating music or just making sure we don’t forget his name, Bieber has added to our Spotify playlists and daily conversations.